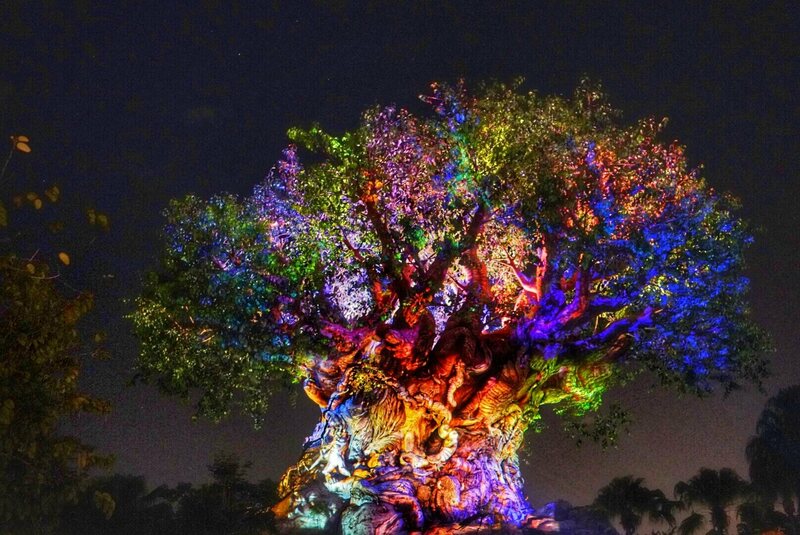 Are you considering going to the After Hours event at Animal Kingdom on your next Walt Disney World trip? Here is a complete review and guide of After Hours so you can see exactly what you can expect and whether it’s a good value for you. Note: Disney did invite me to come to this event to review it, so I didn’t have to buy my ticket, but as always, all opinions are my own. I’ll always be honest with you guys because there’s a lot of options for extra add-ons when you’re coming to Disney World, and I want to make sure you pick the things that are the best fit for you. After Hours is a relatively recent event that Disney has been offering. It started with Magic Kingdom, and you can read my review of that here. It’s a special event ticket that anyone can buy. It’s only offered seasonally and not in connection with any type of holiday events. You get three hours after closing time to enjoy the park with very small crowds. It’s basically giving you the regular Animal Kingdom experience, but with an extremely small crowd level. How small? Disney doesn’t tell us what number it’s officially capped at, but I do know it’s the smallest of any event they offer. You basically won’t find smaller crowd levels in any other event. Much smaller than Extra Magic Hours (which aren’t actually capped at all, just restricted to resort guests) and smaller than both the holiday parties offered at Magic Kingdom. Summary: After Hours gives you three hours to enjoy Animal Kingdom with very few people in the park, meaning little or no wait times for any rides (including Flight of Passage) and unlimited snacks and drinks. To see the Instagram stories from my visit to this event, check out my saved story highlight here. How much do After Hours tickets cost? It’s $120 a person. It’s a stand-alone event ticket, meaning you don’t need an additional park ticket along with it. If you buy your tickets separately, (meaning not as a part of a WDW vacation package) then this could be a day you don’t purchase a park ticket, and maybe take this day to rest, enjoy resort time, or visit Disney Springs. They do take Passholder and DVC discounts so the ticket will run you about $100 plus tax with those. When is After Hours at Animal Kingdom offered? After Hours at Disney’s Animal Kingdom is offered on select nights through Spring of 2019 as of now. If the event continues to get positive feedback it’s likely to be offered beyond those dates as well. Check here for all the dates available to book right now. The event is obviously “after hours” so it happens after Animal Kingdom closes. On the night we attended the hours were 8:30-11:30 giving you three hours of almost empty park time. However, they let you enter the park as early as 7 pm, which is great because that gives you the chance to enjoy any other normal park activities you’d like to do before the party officially begins. So you really get access from 7-10:30 but up until the After Hours event begins at 8:30 you still have the regular day guests in the park. You have a list of certain attractions that are open during the After Hours party, and you can experience them as much as you’d like during the three hours. What attractions does After Hours include? 5 minute wait time for Flight of Passage! Let’s talk about the most exciting thing in this list and that’s the two Pandora rides, Flight of Passage and Navi River Journey. These are two of the most popular rides in all of Disney World. In fact, Flight of Passage, in particular, is still hard to find a Fast Pass for, even though it’s no longer the newest ride. I would go so far as to say this is the best ride at Disney World and one that you can easily do over and over again. But the only way that would ever be possible is during the After Hours event. If you love Flight of Passage as much as I do, this alone is a huge selling point for this event. Another super cool thing that’s included with your After Hours ticket is unlimited snacks. You can choose from any of the ice cream bars they offer, popcorn and bottled sodas and water. There are snack stands throughout the park to pick these up along your way. I gotta say, having unlimited Mickey bars is a huge perk. Is After Hours at Animal Kingdom worth it? In a word, yes. I wasn’t 100 percent sold on this event when I first tried the Magic Kingdom one since I feel like you can enjoy the park with lower crowds any time if you’re willing to stay very late to do so. And while that’s true, I was comparing the crowd levels to other special ticket event parties like Mickey’s Halloween Party or Mickey’s Very Merry Christmas Party. Those parties have lower crowds than a normal park day, (especially during holiday times) but this is an entirely different thing. This isn’t just low crowds. It’s like having the park almost to yourself. It’s a true VIP experience. You feel like someone rented out the whole park and only invited a few people to come to play. After Hours is maybe not as suited for families with very young children who would struggle to stay up that late or would be over stimulated with going from ride-to-ride so quickly with no downtime in between. These may want to consider the holiday parties as they will still give you lower crowds, but they also give you lots of other entertainment in the park and don’t last quite so late. They don’t offer special or rare characters during Disney After Hours as it’s not an event that’s about new entertainment, it’s more about experiencing all the regular park attractions with little or no waiting. Which After Hours party is the best? So for me, the question is not “Should I go to After Hours?“, the question is, “Which After Hours should I go to?”. There are now After Hours events at Magic Kingdom and Hollywood Studios too. Having been to them all I can say they are all good but unique. So the easiest thing is to choose your favorite park. Animal Kingdom has Pandora which is a truly amazing wonder of modern Disney Imagineering. It has fewer attractions to ride, so this isn’t the one to choose if you’re all about those rides. But if you’d love time to soak up all the wonderful theming of Pandora, ride Flight of Passage as much as you want, and enjoy the peacefulness of the park without all the people, then it’s a great option. Magic Kingdom has 22 attractions to experience as well as characters to visit, so there is tons to do and see. All of their headliner attractions are offered, and you’ll be able to blitz through the whole park and cover at least two days worth of touring in three hours. Hollywood Studios is a middle ground between the two. Seven attractions, eight characters to meet and the projection show on Tower is running through Jan. 6th. You also can enter the park early enough to see their nighttime shows too. And Toy Story Land with no crowds and waits is pretty sweet. My reviews to the After Hours at the other parks are linked above. Check those out to find out more details to compare the different options. Overall, Disney World is getting more crowded. We may not like it, but it’s a fact. Over the years things have changed a lot, and all the new expansions within the parks, as well as bringing Marvel and Star Wars fans into the mix means that more people than ever before are planning to visit. The increase in crowds means that we have to plan better and be more strategic to get the most out of our time at Disney World. Or we can pay more to enjoy premium add-ons that give us opportunities to enjoy the parks with fewer people. This is the best one I’ve experienced. If you don’t get to visit Disney World often, it really can be worth it to pay a little more to make the hours you have really count. As always, you can always contact me if you have any questions I can help you with. And follow along on Instagram as I bring you with me each week as I visit the parks, and share tons of tips and info to help you get the most of out of your Disney World vacation.